With a year to go until the UK leaves the European Union, BBC Scotland has been speaking to Scots pondering a future in Spain. It’s easy to understand why so many Scots settle on the Costa Blanca, with its sandy beaches, all-day breakfasts and the promise of sunshine 300 days a year. Spanish officials estimate there are more than 65,000 Britons registered as residents in the Alicante region. Bicycle shop businessman Gary Routledge from Elgin has been living in Quesada for 10 years and is now in the process of applying for residency in Spain. He voted to remain in the EU and he says that since the referendum his business has changed. “Since Brexit kicked in we have started to buy less bikes from the UK due to the fact that bikes have gone up in value – they charge us more for the same bike,” he explained. “So we are now buying more Spanish bikes. We buy 80% of our bikes from Spain now and 20% from the UK, whereas it used to be 100% from the UK. Registering with the Spanish authorities is also on the mind of restaurant worker Caroline Sim, who has been on the Costa Blanca for six years. English language teacher Agnes Miller grew up in Edinburgh but has lived in Spain for more than three decades. She didn’t get a vote in the referendum but campaigned with the Remain in Spain group before the UK went to the polls. She is concerned about what will happen to her language school post-Brexit. One Briton who knows what UK citizens are having to consider as the clock ticks closer to Brexit is Jack Troughton, a journalist working for English newspaper Costa Blanca News. He believes people from Britain who settle in Spain are failing to realise the importance of committing to residency. Jack says: “Brexit is something we have had to cover a lot, ever since the referendum. He added: “One of the other problems is there are people called swallows who spend half their time in the UK and half the time here trying to chase the good weather. “I think a lot of people have tried to wing it, they haven’t done their research. How many Britons have Spanish residency? The British Embassy is keen to get the message of residency across to ex-pats. It’s held 60 separate events in the region on the matter. A spokeswoman said: “One of the main recommendations we give to British citizens in Spain is that they register with their local authorities, in the Padron. “This is a requirement by the Spanish government, to keep a record of number of citizens living in towns. The number of UK citizens registered as resident in Spain has fallen in the past five years – from 397,892 in 2012 to 240,785 in 2017. But Robert Kirkhope, who advises UK Citizens on settling in Spain, said it wasn’t because fewer Brits were moving. Mr Kirkhope, originally from Edinburgh, said there was an initial lull following the Brexit vote, but business had now improved. Further down the coast in Malaga, the Spanish Citizens Advice Bureau, has been inundated with requests for information on Brexit, with 30,000 people posting on their website since the referendum. 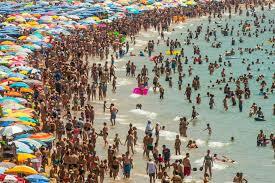 The tourist season is not yet fully under way on Costa Blanca. However, many people believe as long as the sun keeps shining British citizens will continue to flock to these shores after Brexit.